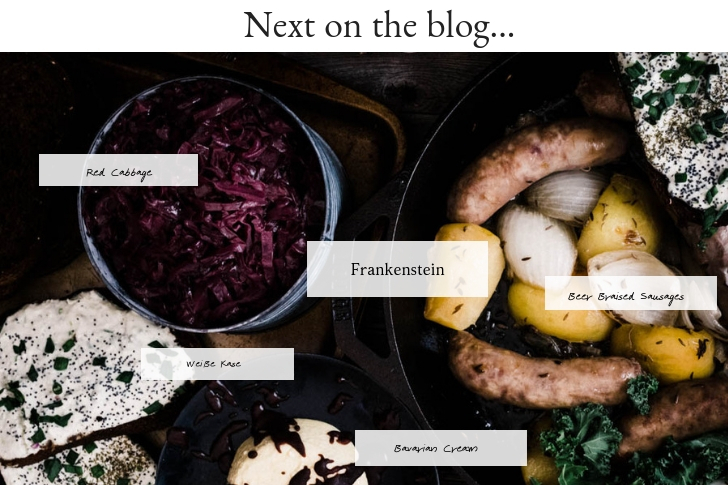 This recipe was inspired by “Harry Potter and the Deathly Hallows” written by J.K. Rowling. On that warm, slightly blustery, early evening Harry quietly looked around at the motley crew gathered around the two giant, mismatched tables. There were twinkling bubbles floating about like giant fireflies, charmed to light up the party goers. Huge platters of pickled tomatoes with bacon, potatoes with pea pesto, giant roasted turkey legs and many other dishes covered the space between him and his friends. Over the groaning tables filled with dishes, including a 3-tiered cake with a giant Golden Snitch on top, he thought about the lives that were being risked just by being close to him. All of his favorite people, here at this celebration of his coming of age, could be gone in an instant. Quite morbid birthday dinner thoughts, but with all of the hubbub around his lack of conversation wouldn’t be noticed. He looked over at Ron, grinning goofily at something Hermione had said. Mr. and Mrs. Weasley boisterously laughing with 2 of their sons and Remus. Tonks and Ginny excitedly whispering, about what he could only imagine, but he thought Tonks’ eyes had a joyful mischievousness in them. 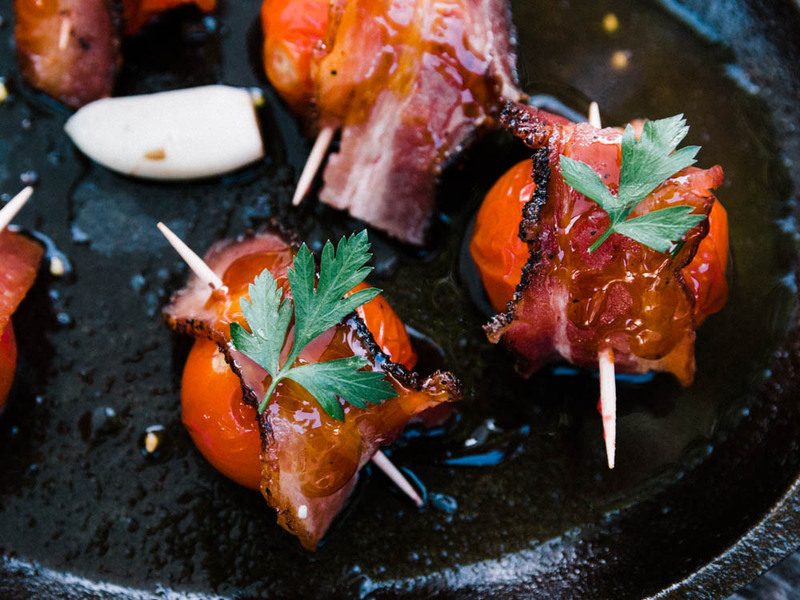 He bit into a tomato just ripe from the garden, that had been lightly pickled, wrapped in bacon and drizzled with a honeyed glaze made from apple cider. Wow. Mrs. Weasley had really upped her game! Combine vinegar, water, salt, and sugar in pan and heat until lightly boiling. Then remove from heat and allow to cool for about 20 minutes, then add garlic and peppercorns to the vinegar mixture. Add whole tomatoes to 32 oz jar with tight-fitting lid (as many will fit), then pour vinegar mixture over until jar has about 1/2 inch room before the top of the jar. Allow to brine for 24-48 hours. Pour can of hard cider into small pan on medium heat and simmer for 30 minutes, or until the mixture looks like a light maple syrup. Heat the oven to 400℉ and line a baking sheet with the bacon and bake for 15-20 minutes, until slightly crispy but still bendable. 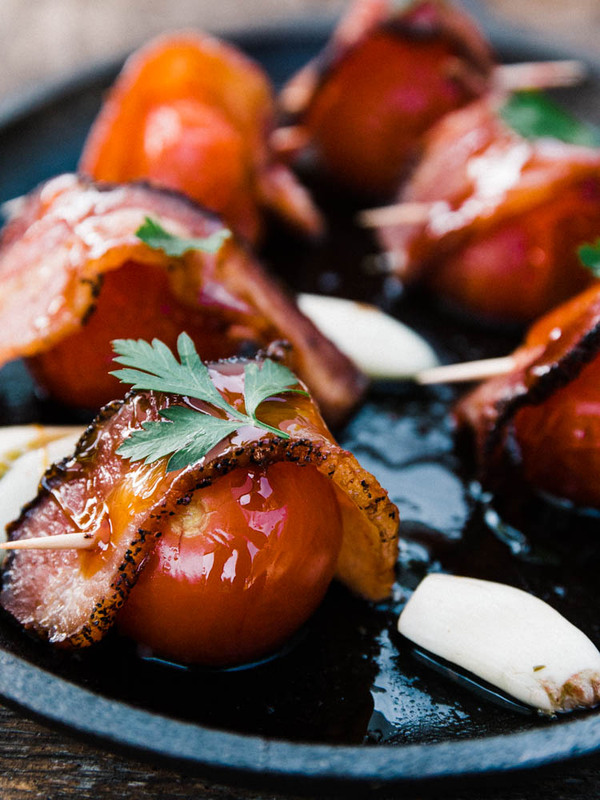 Pull out the tomatoes and spear the bacon around the tomato with a toothpick, then drizzle with the hard cider glaze.